Welcome to part 2 of our two-part series, where we share the best Deep space objects for beginners. In part one, we covered spring and summer, this time we're looking at the best DSOs for the fall and winter seasons. Most astronomers agree that winter and fall are the better part of the year for stargazing. Nights are longer, darker and begin earlier. We can stargaze straight from work and see and take pictures of more deep space objects than is possible in summer. Also, the skies are full of many more new and exciting objects for us to enjoy! Below we share some advice on telescope filters, which will help you see more DSO details than you'll ever manage without. But, if you want to skip straight to the DSOs themselves, open the navigation box below and select fall or winter. One of the best ways to view deep sky objects is to use filters. As the name suggests, filters attach to your telescope and filter out most wavelengths of light. Pick the best telescope filter for a galaxy, for example, and what you are left with is a much clearer view of its shape and structure. The best telescope filter for nebulae is different to that for galaxies because they emit light on of different wavelengths. So, the trick with choosing the best telescope filter for deep sky objects is picking the specific one for object you want to see. As its name suggests, this is a more general filter designed to reduce the impact of artificial light on the qulity of your seeing. They are effective against sodium and mercury vapor lamps and work by blocking (filtering) out light from those wavelengths. The view you are left with is no brighter, but it is much 'cleaner'. The specific benefit is fainter objects - like galaxies and nebulae - now show up in better contrast. This is because the filter makes the background sky darker. If you operate to a tight budget we recommend something like this Gosky filter from Amazon. If you have a bit more money to spend, then you could experience better results with this Orion filter instead. Note: these filters are not effective against LED street lamps. LEDs emit light across the spectrum and it can't be filtered out by an LPR filter. Narrow band filters for telescopes bring nebulae to life by giving them high contrast against the background space. These filters only let through certain wavelengths of light, such as OIII and H beta to pass through. These are wavelengths which emission nebulae 'shine' in and so they are left untouched by the filter but all other light is removed. For best results, use these filters in skies which already offer you good seeing (they don't have much benefit under heavily light-polluted skies). These are a more expensive filter, because they are harder to produce, but an option like this Celestron Narrowband OIII filter is a good choice. The line filters are even more finely tuned as to the light they will let pass. These are the best telescope filters for planetary nebulae and diffuse emission nebulae. As you might expect by now, these are a higher price still and this model from ﻿Lumicon will set you back well over $200 on Amazon (but is only suitable for 10" scopes and above). Our advice is to start with a simple LPR filter. These are three great DSOs to look out for from your backyard between October and December. We admit it: this one is a little ambiguous for seasons. It is easily visible in summer but looks gorgeous against the inky blackness of a fall sky. Albireo is a one-of-its-kind double star system. It comprises of two stars of very contrasting color: Alberio A is the brighter star and fiery yellow, whilst the dimmer Alberio B is sapphire blue. Finding it is easy. Head over to Cygnus, the swan, on a clear autumn night. 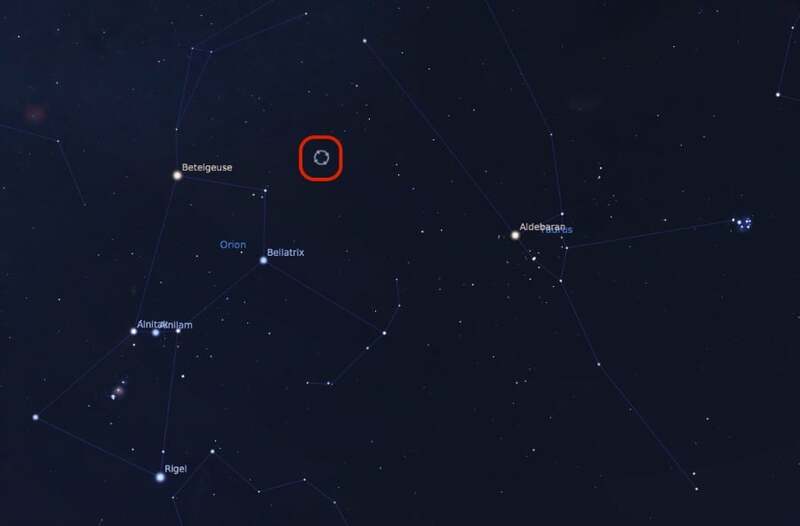 The head (or eye) of the swan is Albireo (see red box in Stellarium screenshot, below). It lies in the center of the triangle formed by Vega, Deneb and Altair. It appears to be a single, moderately bright star. It's best viewed at a low magnification to bring the stark contrasting colors to life. We don't yet know if the two stars orbit each other in a binary system, or are just an optical double (i.e. they look close together from Earth). We don't know because we've not yet detected enough motion since their discovery. This is because the distance between them is quite large - 60 times the diameter of our sun, meaning an orbital period of at least 100,000 years! 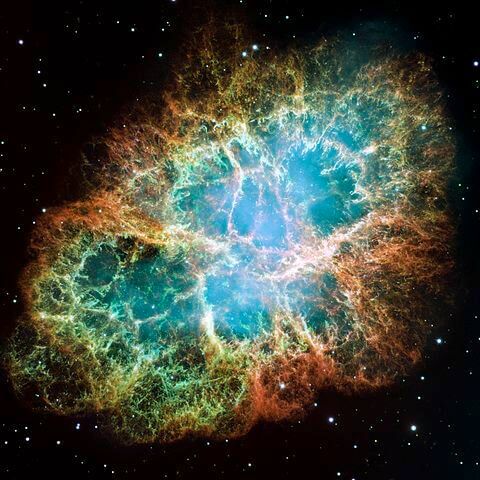 The Crab Nebula is the first object in the messier’s catalogue - M1. The Crab Nebula is the remnant of a supernova that was first observed on 4 July 1054 and was visible for about two years. The core of the exploded star lies at the heart of the cloud as a pulsar. These are incredibly dense and rapidly rotating objects that emit high levels of radiation. Astronomy quiz facts: The Crab Nebula is 11 light years across and growing larger by around 1 billion kilometers per day. That's further than the distance from the sun to Jupiter! The Nebula produces 75,000 times more energy than the sun and emits radiation from the entire range of the electromagnetic spectrum. The Crab nebula is visible from late autumn to early spring in the northern hemisphere. A standard telescope will show faint details. 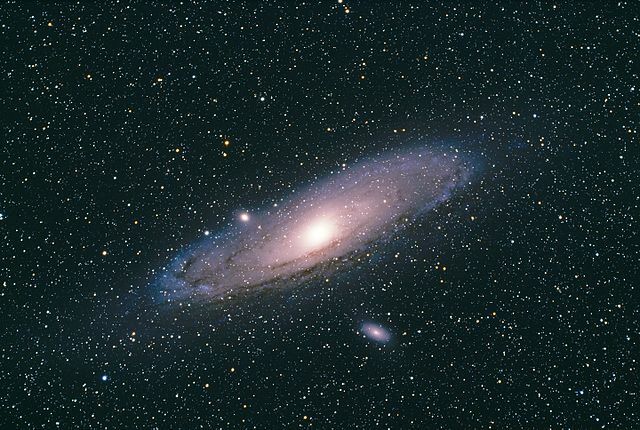 Andromeda galaxy (M31) is one of the most sought after objects, especially by newbie astronomers. It is the most distant object visible to the naked eyes, at a distance of more than 2 million miles. Conversely, it’s our nearest galactic neighbour in intergalactic space. Both the Milky Way and Andromeda are part of a larger cluster - the Local Group. The Local Group is itself part of the even larger Virgo Cluster, which itself is a part of the Virgo Supercluster! Phew! 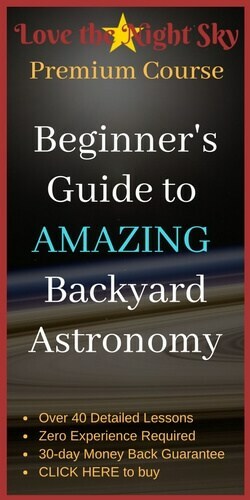 We have a complete guide on how to see the Andromeda Galaxy, here... but the brief version follows. Finding the galaxy is quite simple. It’s visible throughout fall and winter. To locate it head over to Great Square of Pegasus. 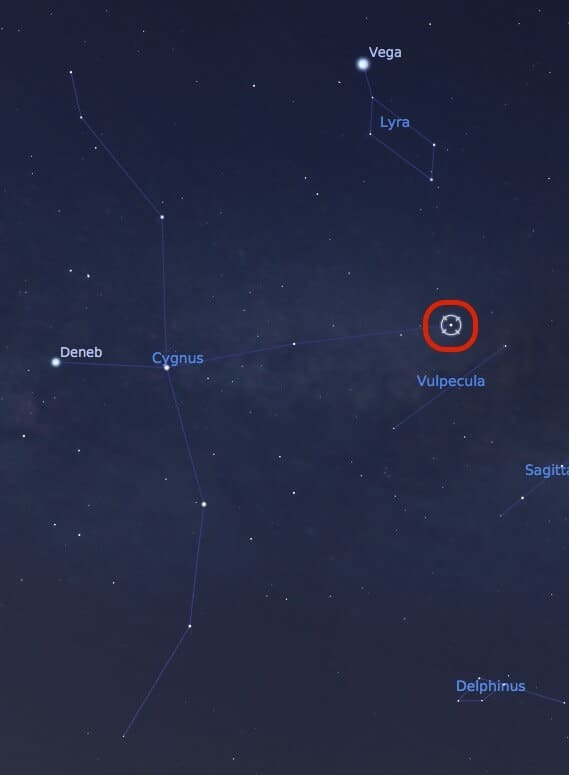 You can see it in the clickable Stellarium shot below. It’s as simple as that. You can spot it with bare eyes in a dark sky with good seeing. A telescope will reveal the finer details and if seeing conditions are great, you might even see more structure within the galaxy. Try using averted vision to improve your chances. The light you see is the combined starlight of trillions of stars, each one roughly as big as our sun. And all that is moving towards us at a speed of 250,000 miles per second. Our advice: know the staggering numbers, but focus on the beauty of this galaxy. We finish this two-part article (first part here) with a look at the best deep sky objects for beginners from January thru March. 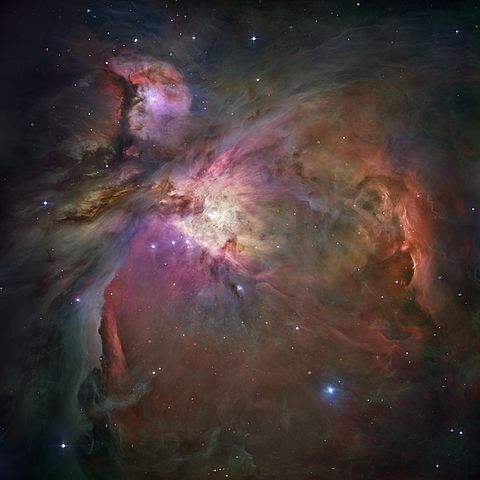 The Orion Nebula (source) You can buy this picture. 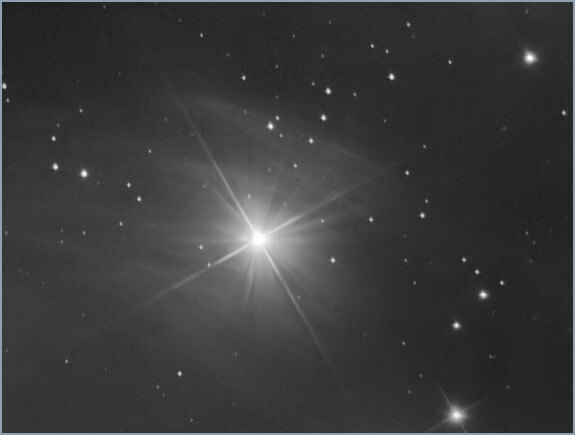 Easily seen with naked eyes, it surrounds the middle star of the three in Orion's sword. Its faint, pinkish glow gives it away. Although visible with binoculars, your telescope will show off its true wonder, with the bonus that it offers two sky objects for the price of one! The Orion nebula is an emission nebula, energised by four hot young stars called the Trapezium Cluster, owing to their trapezoid shape. A 6" scope and good seeing will reveal them to you but your odds of finding them increase with a larger aperture telescope. As beautiful as these pictures are, don't forget that it (sadly) won't look as good through your eyepiece. But you can try enhancing your view of M42 using a filter like the ones recommended at the top of this page. This is Pleiades cluster, commonly known as Seven Sisters or M45. It's an open cluster of more than 1000 stars held together by their combined gravity. 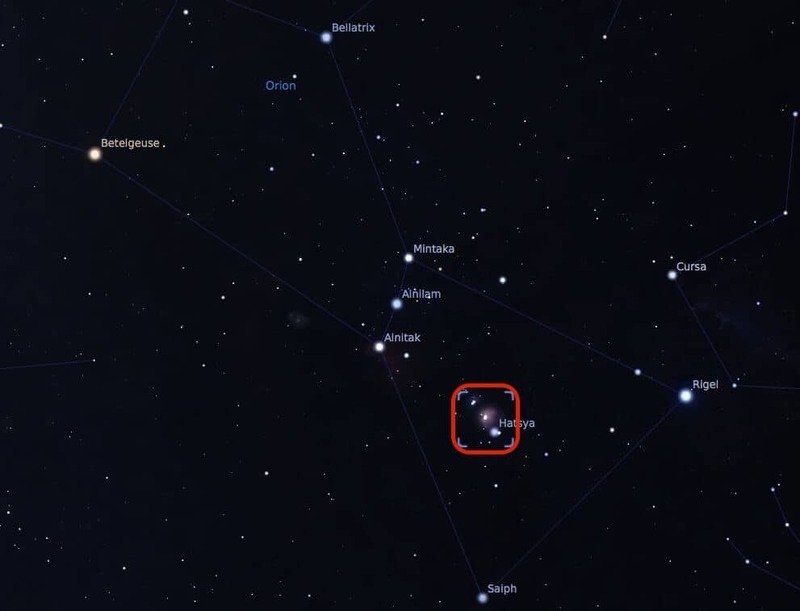 The brightest stars in the cluster represent the Pleiades, the Seven Sisters in Greek mythology, their parents, the nymph Pleione and the Titan Atlas. The cluster itself is big - at almost 2 degrees in diameter - and bright enough to see in moderately light polluted skies as well. It looks particularly good in binoculars. The cluster is prominent in northern hemisphere winter skies, making it easy to find. 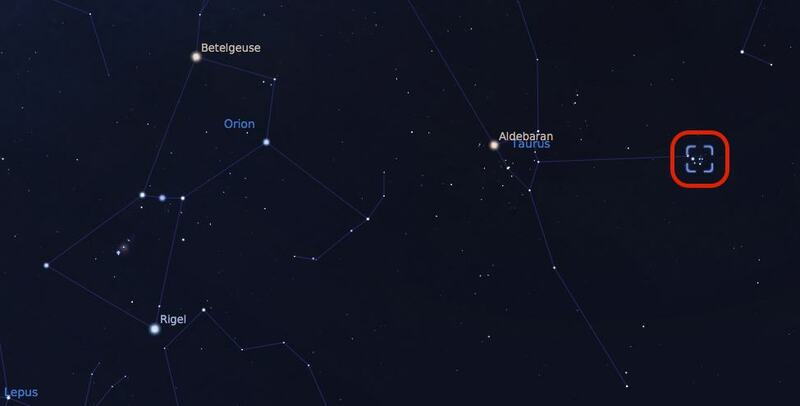 You can find it west-northwest of Aldebaran, the brightest star in Taurus. The Pleiades is a gas-filled region of space, stuffed with protostars (think of them as toddler stars). M45 also contains a significant number of brown dwarfs; they are believed to constitute up to 25 percent of all the stars in the cluster. But, don’t be too eager to spot one, they are dark, boring and unremarkable. 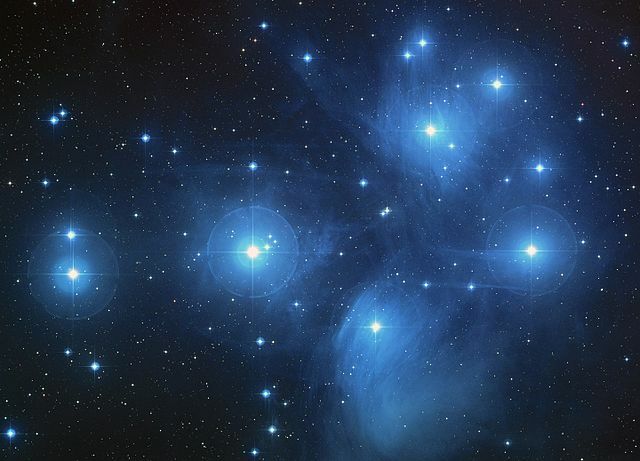 For more interesting facts about the Pleiades, here’s a usefu﻿l article ﻿from﻿ constellation-guide.com. 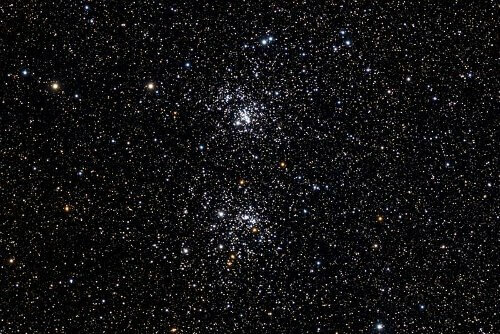 The Perseus double cluster is not included in the Messier catalogue. But, this breathtaking pair of clusters, each containing hundreds of supergiant suns, is worth your viewing time. 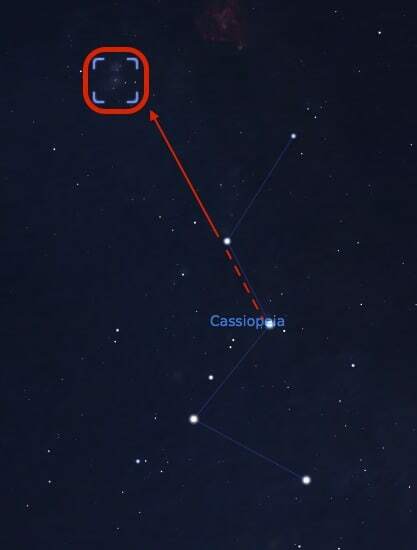 To locate it, head over to the W (or M) shaped constellation Cassiopeia and use the image below to guide you from the star called Navi, to Ruchbah (dotted line) then follow the same direction to the double cluster. A point to note is, the Double Cluster is harder to see when it’s close to the horizon. If you can’t spot it between Cassiopeia and Perseus, wait until later in the night (or year) to see it, when it’s higher in the sky. These clusters are rather interesting - at a distance of about 7000 light-years, it’s a wonder we are able to see a cluster of only a few hundred stars. The reason we can is these stars are very, very bright. About 50,000 times more luminous than our sun! They are also relatively young at 3 to 5 million years old. The Pleiades cluster, for comparison, is 100 million years old. A fun fact to note is: if the Perseus double cluster was as close as Pleiades is, it would cover a quarter of the night sky! While observing this cluster, try to notice the myriad colors of stars: topaz, sapphire blue, white and red supergiants. Many supergiants are close to their end of life, and will end in a spectacular supernova! But we won't be there to see it. That's the end of our two-part guide to the Best DSOs for Beginners. But, if you want more good winter and fall DSOs (and there are thousands to pick from) give this article from Space.com a read. 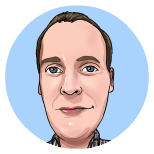 If you’d like to have a personalised list on the best DSOs for you based on your location, time and other such parameters, we have a good news for you! There's a full guide at the end of part one of this article on how to use it. 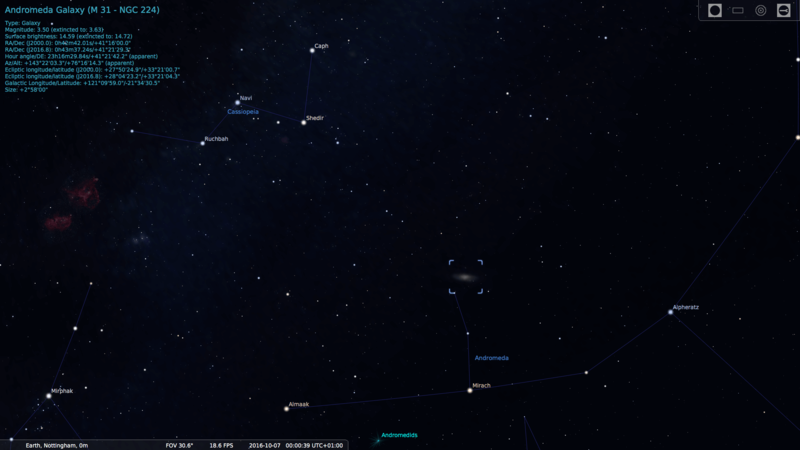 Other than that, we always recommend having a copy of Stellarium, the free skymap software. Many of the screenshots in this article were generated using it. Disclaimer: Some ﻿links﻿ in this article are affiliate links, which ﻿could﻿ earn us a small commission﻿ if you buy something after clicking on them. Click ﻿here﻿ to find out more.